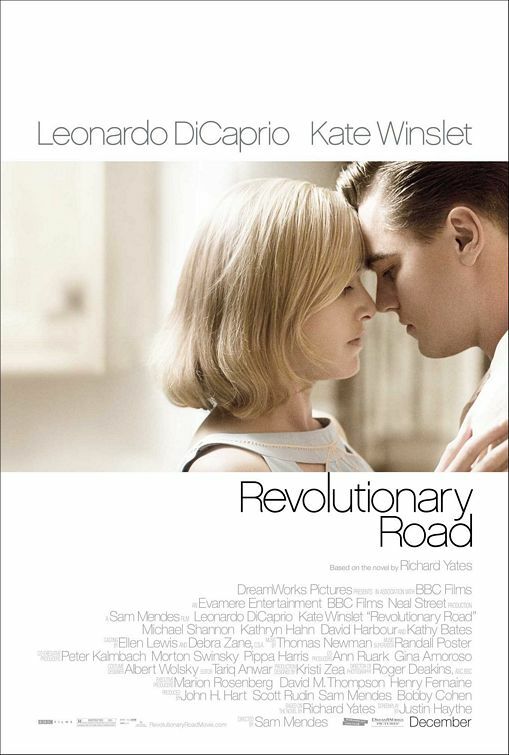 Based on Richard Yates’ 1962 novel (selected by Time Magazine as one of the 100 best English-language novels since 1923), director Sam Mendes brings ‘Revolutionary Road’ to the big screen and reunites its stars for the first time since they paired for the highest grossing film of all time, ‘Titanic’. The film opens boldly enough, spending just a few fleeting moments showing us how the Wheelers (DiCaprio and Winslet) met before throwing us head first into their disaster of a marriage. It’s the 1950’s in Connecticut. Frank (DiCaprio) and April (Winslet) Wheeler are married with two kids – a bickering couple that can break into a screaming match of hateful words in an instant. Both April and Frank seem to hate their mundane existence. Frank commuting to his soul-sucking desk job every day and April attending to her two kids like what is expected of her. It is April who takes the initiative to find a solution and mend their marriage. She proposes to relocate to Paris and start a new life. The plans reinvigorate the couple and everything seems on the right track. Despite the shocked reactions of their friends, the Wheelers are resolute in their plans. But slowly events transpire which challenge the ability to keep their plans afloat and thus their marriage. ‘Revolutionary Road’ dissects a marriage, in two distinct and significant directions. The movie captures the timeless torment of an unhappy marriage, in the way the spouses know each other’s weak spots and go for them, and in the way arguments can explode the simplest of beginnings. The acting is of the highest caliber, especially by the always-amazing Kate Winslet. Whether she is yelling at Frank or holding back her emotions, you always feel April’s pain and empathize with her desire to escape a life of mediocrity. DiCaprio is just as good, and you can’t help but feel for his affecting but flawed, character. Moreover, the set design and costumes are immaculate, and the cinematography is perfect. But as you are an hour into the film, you will realise, although DiCaprio enjoys the same screen time, it is Winslet’s film. ‘Revolutionary Road’ can be interpreted in many ways. You can watch it from Frank or April’s point of view. Mendes’ direction shines through the dim premise and while it’s unlikely to leave any audience member happy, simply due to its depressing nature, it may just enlighten some.